When I first got married, I could not bake chicken for the life of me. No matter what temperature I baked it at or for how long, when I served it, it would still be pink (or even bloody) in the middle. After almost 8 years of marriage, I have finally perfected a baked chicken recipe that is simple and healthy. This recipe can be adapted to accommodate any type or amount of vegetables you have on hand. I served this with the quickest dinner rolls from scratch I’ve ever made before (see recipe here). The amounts listed below are what I had in the fridge. 2. Mix salt, thyme, 1½ teaspoons pepper, and nutmeg in small bowl. 3. Spray a 9×13-inch baking pan with nonstick spray. Place vegetables in the pan. 4. Sprinkle half of the spice mixture on the vegetables. 5. Lay the chicken over the vegetables. Sprinkle the remaining spice mixture on the chicken. 6. 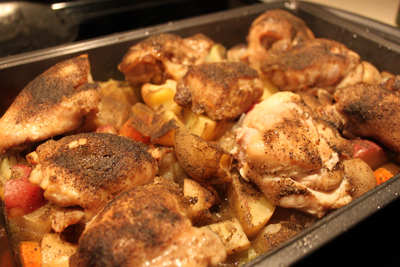 Cover with foil and bake until the chicken is golden and cooked through, about 45 minutes. Serve. Comment love: What are you favorite chicken recipes? Wow, this is almost my exact recipes too, except I throw in a bunch of whole garlic cloves. So yummy!!! Just made this tonight and used chicken breasts, parsnips and it was a crowd pleaser for sure. Thanks! I’m putting this into heavy rotation for the winter. The nutmeg was a nice, unexpected flavor. Glad you liked it! It’s a great dish to make and bring to friends in times of need (e.g., after baby or bereavement) too.